May 5, 2016 was the day we moved to Lawrenceburg, TN. The morning moving day routine was humming along quite nicely until we discovered our brake lights weren't working. Had to change out a fuse and of course the fuses are not labeled so it was a game of pick and choose to find the right one! The drive had a little rain but mostly just cloudy skies and very little traffic. We stayed at the Powder Horn Campground. 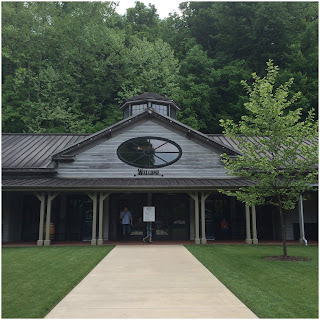 It is an interesting place and we certainly felt like we were in southern Tennessee! There are a number of permanent residents and most are kept up fairly well, but there are a few that are not. 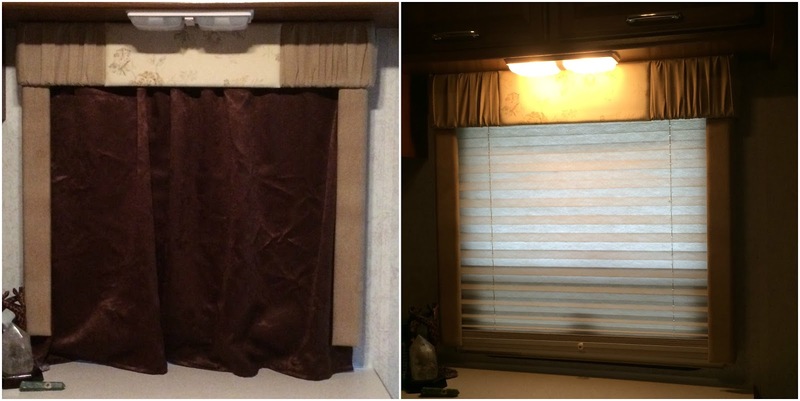 The sites are very narrow, but long enough for our RV and car. Our site was shaded but many are not. It was $130.00 for the week for full hook-ups. There are also cabins to rent. They have a small store with a number of Confederate and hand-crafted items. There is also a church on site, but it doesn't seem anyone attends. Two pit-bulls live on site, one is just a puppy, but the owner of the other one likes to tell you how much his hates other dogs! Stayed as far away from that trailer as possible. 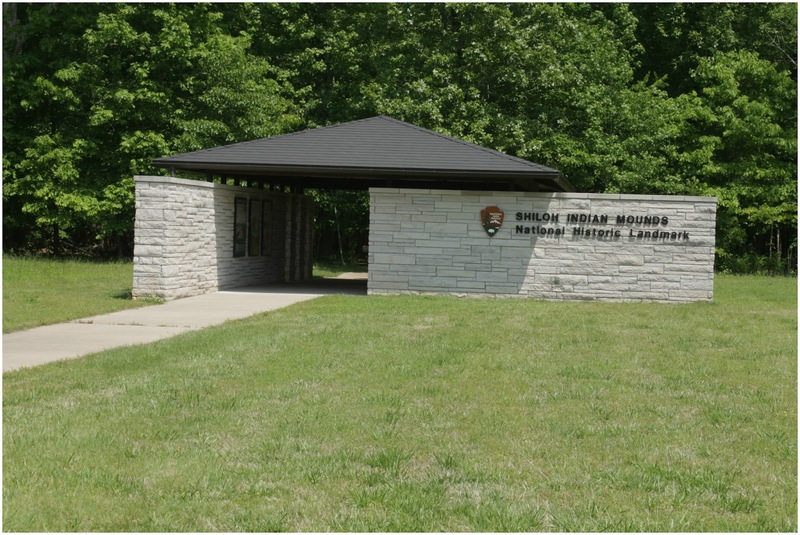 Shiloh National Military Park preserves the Shiloh and Corinth battlefields of the American Civil War. 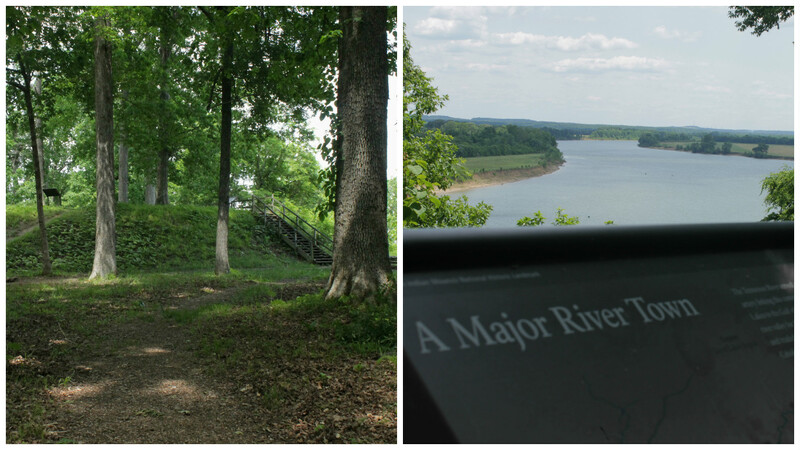 One of the first major battles of the war took place here over a two day period, April 6 and 7, 1862. The park was established in 1894. In 1904 Basil Wilson Duke was appointed commissioner to handle requests of local farmers to do something with the park, as they were tired of their pigs rooting up the remains of soldiers that had fallen during battle. The park is close to 3,000 acres and has 20 monuments along a driving tour. 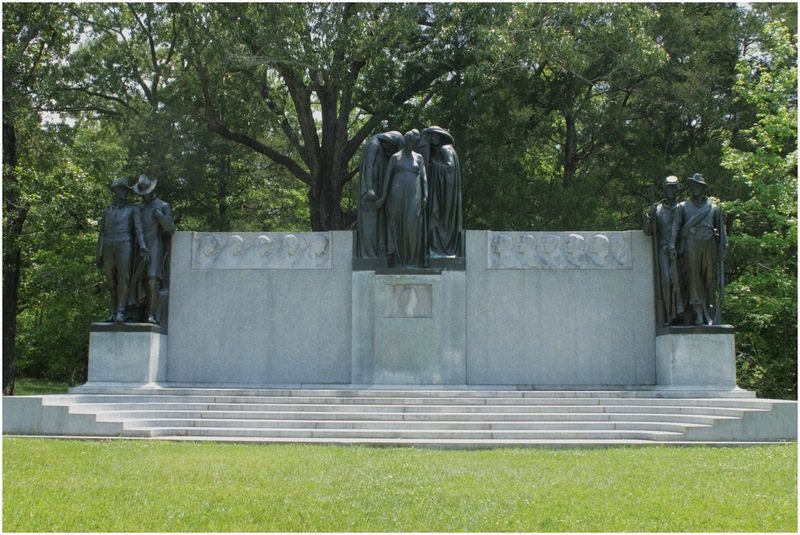 This memorial honors the South's "Lost Cause" on the Shiloh battlefield. In the picture on the left a Cavalryman spreads his hand in frustration, the rear figure represents the Confederate officer corps, his head bowed because of his failure to bring victory. The center picture is "Defeated Victory". 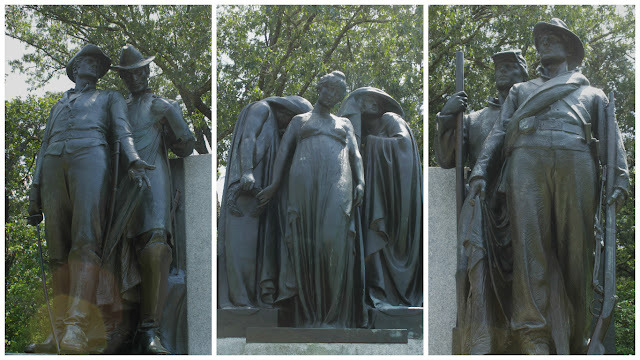 The Confederacy (center) surrenders the laurel wreath of victory to Death (on her right) and Night (on her left). Death took the Confederate commander-in-chief, while Night brought Union reinforcements. In the picture on the right an Infantryman snatched up the Confederate flag in defiance of the U.S. Army and an Artilleryman calmly gazes through the smoke of battle. 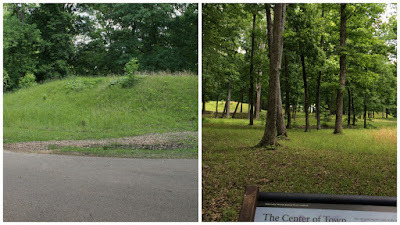 We went in search of the Shiloh Indian Mounds, which is how we found the military park. We didn't know the mounds were a part of it. A little disappointed in the mounds. Not really developed as much as it could be, but the info signs were interesting. The village was on a high bluff overlooking the Tennessee River. The village was encircled by a wooden palisade, and enclosed by two steep ravines. It consisted of more than 100 daub houses. It was probably the center of the chiefdom that occupied a 20 mile stretch of the river with six other smaller villages. There were seven mounds, six were used for places of importance, temples, meeting houses, or homes of village leaders. One was also used as burial grounds. The mounds were towards the outside of the village, with the center being flat and where the houses were built and the farming was done. 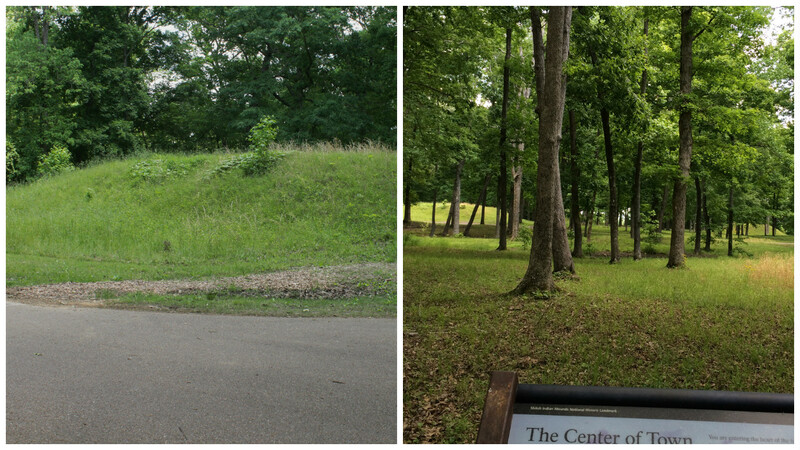 The westernmost mound was used after the Battle of Shiloh to bury fallen soldiers from the 28th Illinois Infantry. The bodies were later reinterned in the National Cemetery. The Mississippians, who lived here were not nomadic hunter-gatherers like their ancestors. They were farmers, and their lifestyle was based on corn. All the information about them is based on Archaeological discoveries. Pieces of pottery, stone tools, mica tools and jewelry and other artifacts have allowed them to develop a story of everyday life here at the mounds. - Based on evidence from the fence line, this community must have been peaceful most of the time. - The discovery of small stone disks in various places in the settlement shows this group played a game called Chunkey, a small round stone was rolled and contestants threw a spear to where they thought it would stop. One stone that was found was made of coquina shells, only found in Florida, so it was either obtained in trade with people from that area or those who dealt with them. - Families lived in clusters of small dwellings. Parents, grandparents, aunts and uncles all lived close. Clan members were related through the female line; males and females belonged to the kin group of their mothers. Men held the prominent public leadership posts, but homelife revolved around the women. little covered in seed pods! Between 1100 and 1300, this town was one of the largest and most impressive communities along the entire river. This was one of the few places in the eastern US where the surface remains of prehistoric houses are still visible. There is no written record left by the people who lived here, so, many questions remain. Archaeological evidence shows the town was abandoned for some unknown reason several hundred years before the arrival of the first European settlers. There is no evidence they left abruptly or were forced out. It is believed that this site and another in Savannah, TN were actually built much earlier, about 2000 years ago. 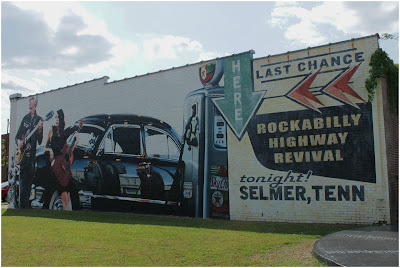 Selmer is on the Rockabilly Highway. 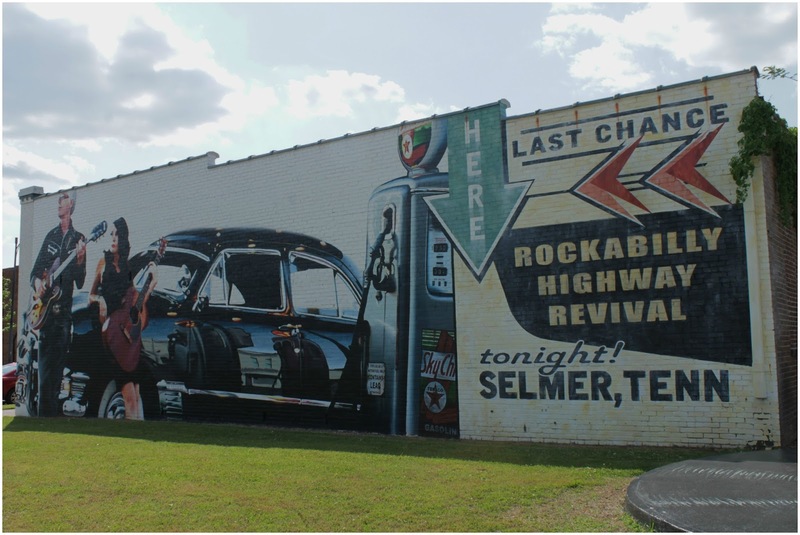 The 55-mile stretch of Highway 45 between Jackson, TN and the Mississippi state line, was officially named Rockabilly Highway on March 26, 2008. A number of the towns along the way hold music festivals throughout the year. 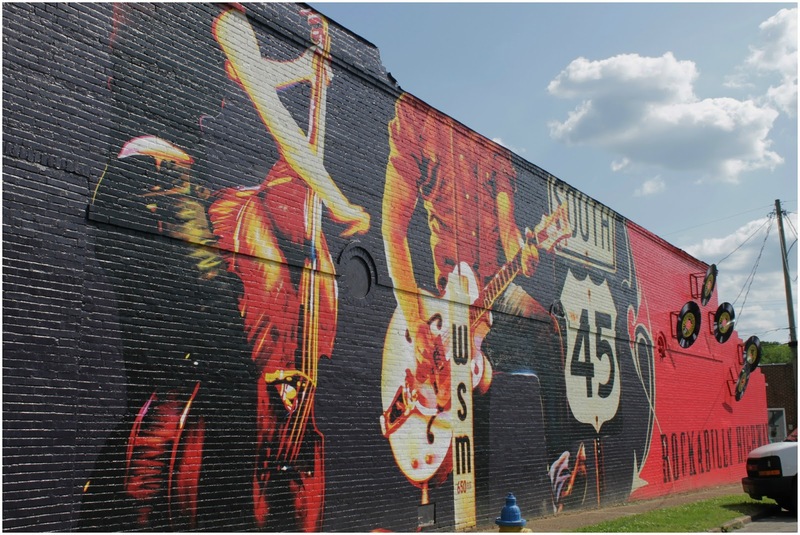 The two murals were painted by Nashville artist Brian Tull. We didn't realize that Tennessee has such a large Amish community. It is in Ethridge, just north of Lawrenceburg. It wasn't really what we expected, nothing like any others we have been to. The Amish Welcome Center was a flea market, and the block around it was nothing but flea markets as well. Wandering through them was fun and entertaining, although we only saw one Amish person. At the welcome center you can get a map that shows you where other Amish stores are for things like, candy, furniture, quilts and such. We did stop at one for some Amish cheese. Muscle Shoals, AL, played a key role in historic land disputes between Native Americans and early settlers in the late 1700's and early 1800's. In 1921 Henry Ford, accompanied by Thomas Edison, came here with the idea to develop the area into a large city. "I will employ one million workers at Muscle Shoals and I will build a city 75 miles long" Ford said. Once this was known real estate speculators started buying up land and selling it off in 25-foot parcels that people were buying sight unseen, and putting in sidewalks and street lights. While Ford's plan didn't turn Muscle Shoals into a huge city, it did lay the foundation for the city. Of course what the city is known best for is its music. We did a drive by of the Fame Recording Studio, where it all started. Unfortunately, we got there just after it closed. Many big names have recorded their music here since the 1960's, Percy Sledge, Aretha Franklin, Wilson Pickett, Bob Dylan, and the Rolling Stones to name a few. There are two large metal rock 'n' roll sculptures in the area by artist Audwin McGee. Helen Keller was born just down the road in Tuscumbia. We didn't do the house tour as it was in the 80's and we couldn't leave puppy in the car, but we were able to get a picture of the house. Helen Keller was born at Ivy Green on June 27, 1880. She spent her life working to improve the lives of people with blindness and other disabilities. She was a co-founder of the ACLU in 1920. She died on June 1, 1968, just weeks before her 88th birthday. 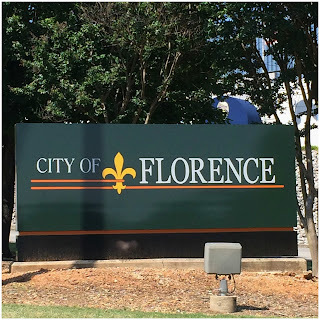 To get to and from Muscle Shoals you cross the Tennessee River at Florence, AL. 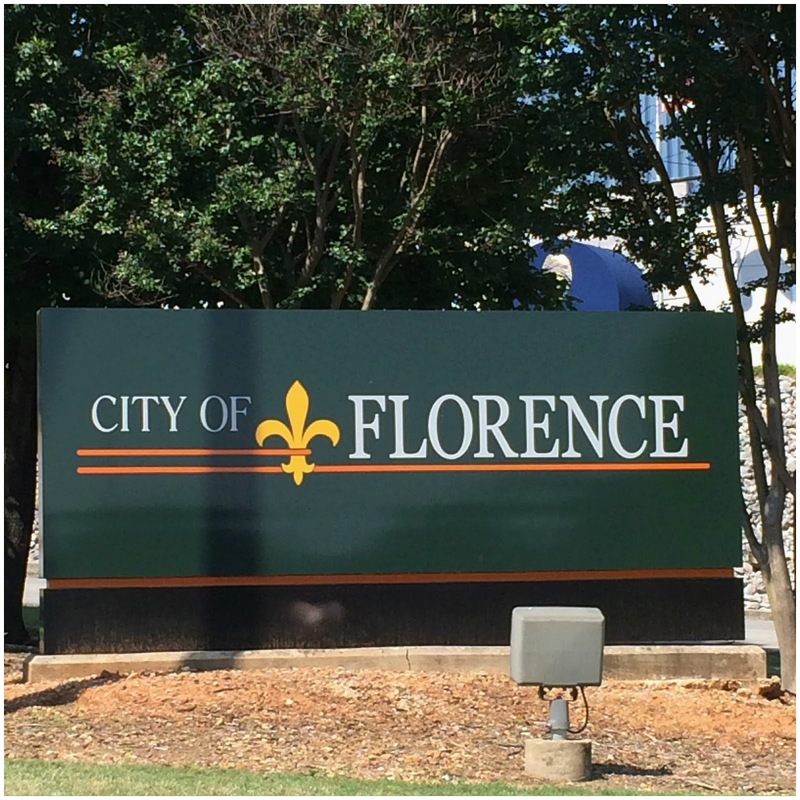 Florence was Nancy's moms name. We stopped at the Singing River Brewery and had a Mother's Day beer in memory of Nancy's mom. She loved beer so it seemed appropriate. What makes it even better is that the Wilson Dam is on the eastern edge of Florence, Nancy's maiden name. Huzzah! 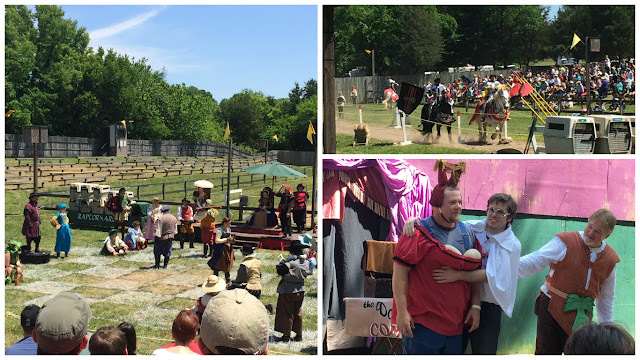 The Tennessee Renaissance Festival was so much fun. We have only been to the one in Michigan and it has been a number of years since we attended that one. We enjoyed the jousting and a human chess game, had yummy food and laughed so hard at the Da Vinci Brothers show. On our drive in we saw a castle up on a ridge and looked it up on line to see what it was. We then discovered that this was the first weekend of the festival, held on the property of the castle. 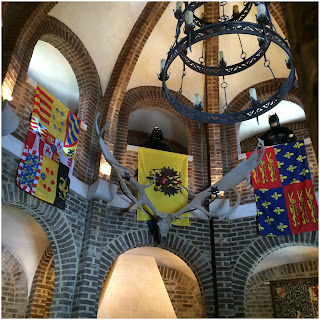 Tours of a portion of the castle are included in the ticket price. Castle Gwynn is the dream home of Mike Freeman. He started dreaming of living in a castle in high school. The first tower was started in 1980, it is five stories high and the first-floor kitchen is the crowning glory. It took Master mason Kenneth Canady two years and 14,000 bricks to make the 60 arches that are in this tower. hold statues of Batman, Darth Vador and a knight. The 2nd tower was started in 1985 and holds the great hall. It has a large fireplace, and is home to one of the resident knights and his loyal steed. Work continues on the castle to this day, a never ending project. Rutledge Falls is in Tullahoma, TN. The falls are on private property but it is open to the public. A short walk from the street brings you to a spot where you can view the top of the falls. A little rock climbing is required to get down to the waters edge. At the top of the falls is a lone statue, called Lady of the Falls. As Mielikki's name, translated from Finnish means Lady of the Forest, we had to go and see her. This was not always her name. She is the only surviving statue of three that were once on the grounds of the Tennessee Capitol building during the Civil War and for many years after. The statures were named Morning, Noon and Night. Lady of the Falls was once called Night. 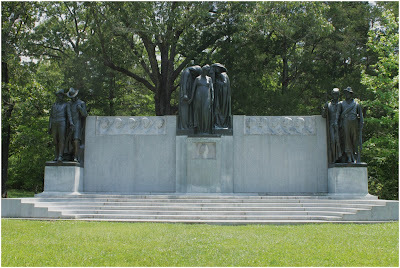 The owner of the property the falls is on found the statues stored at the Ellington Agricultural Center in Nashville, where they had been moved to when the capitol building grounds were renovated. He asked for one of them and was given Night and moved her to Rutledge Falls around 1958, and she has been called The Lady of the Falls since. The area is beautiful, so peaceful and full of lush green trees and ferns. It is also home to some snakes, we came across one enjoying the sunny day. 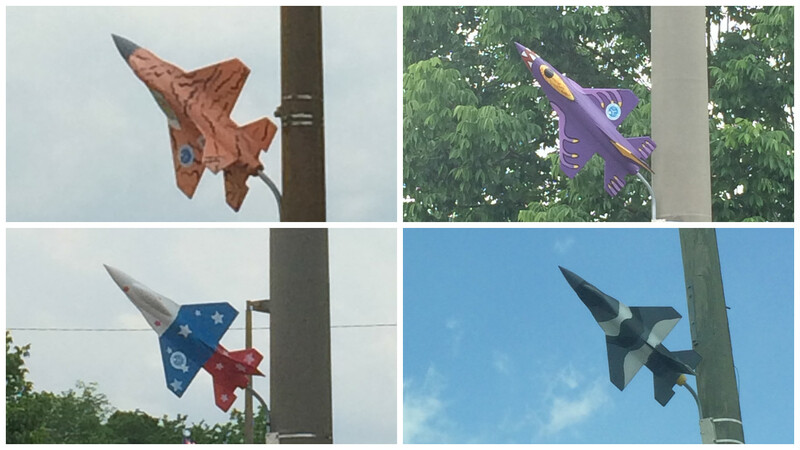 Tullahoma is home to Arnold's Air Force Base, all of the poles at every stoplight corner have jets on them, painted in all different colors and patterns. 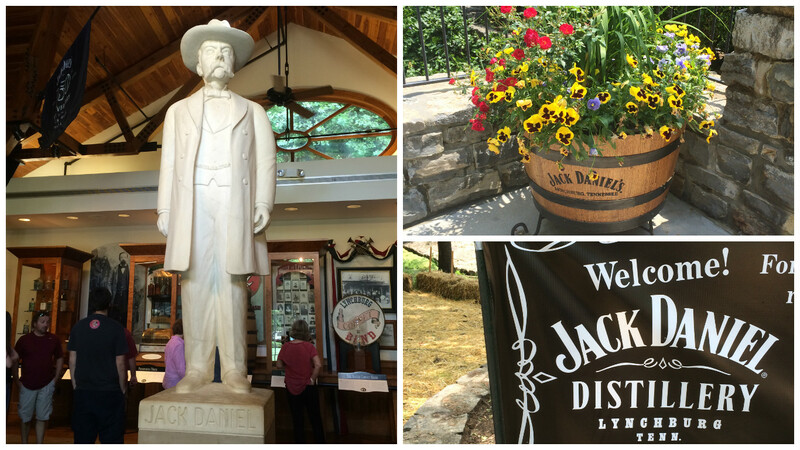 On the way to the falls we passed through Lynchburg, home to Jack Daniels Whiskey. So of course we had to stop. We didn't do the whole tour, as it was almost 2 hours long and we had the dog with us and water falls to explore. 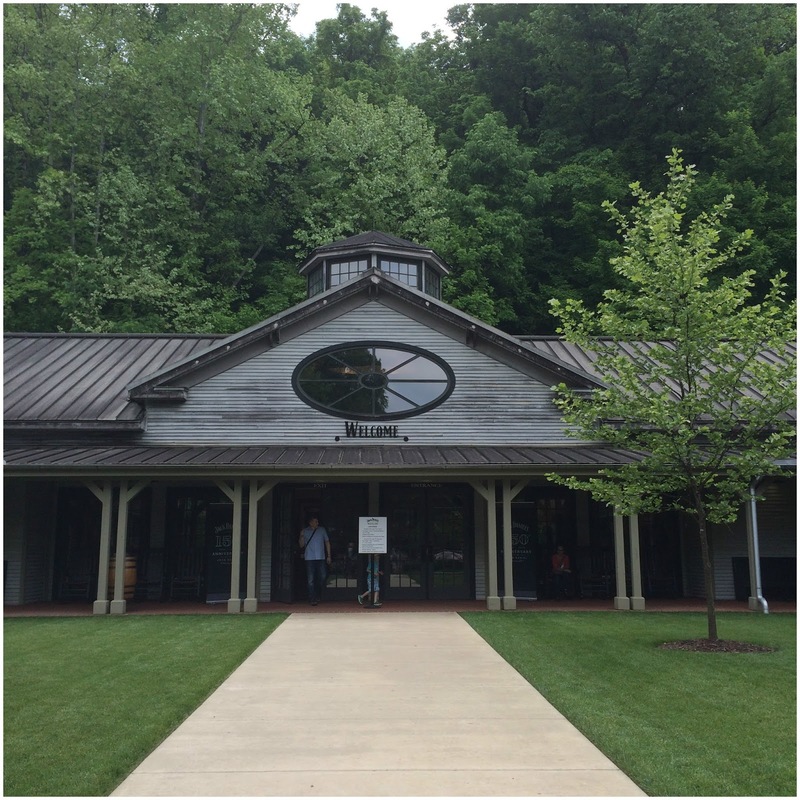 We did go into the visitor center which has nice displays that take you through the 150 year history and the process of making the whiskey. 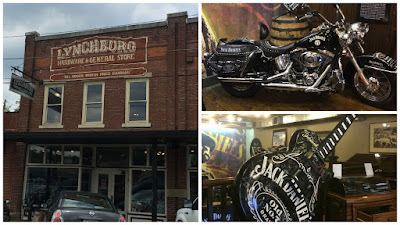 They have a small store where you can purchase bottled whiskey, but they do not have any swag there. No glasses, shirts, or any of the other fun stuff that we found on the Bourbon Trail in Kentucky. 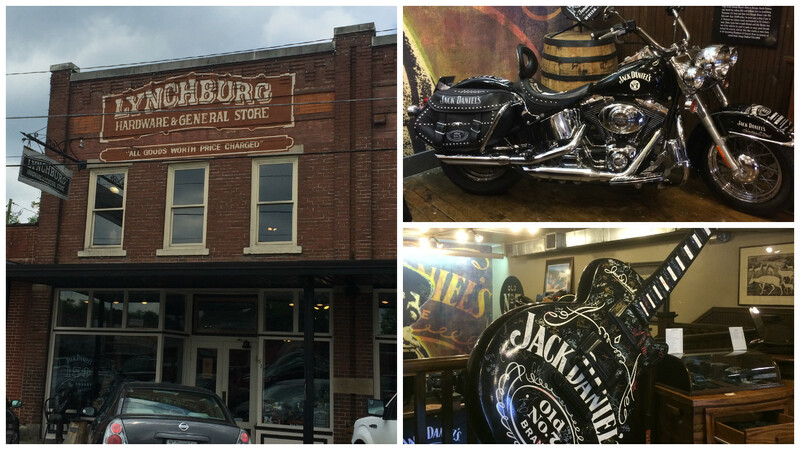 You have to go a couple of miles down the road to the Lynchburg Hardware Store to find all of that. Seemed a little strange to us, but it is a cool place and there are a number of other shops including the Moon Pie General Store! We lost two days of sightseeing on this trip. One was spent at R.P. Williams Repair shop, as the ABS light and service engine light came on in the RV while driving in. They ordered a part but it missed both delivery trucks and we went home with out it fixed. Went back the morning we drove to Kentucky and they put the new sensor in but it didn't fix the problem! So back to square one and looking for a new place to take it. Second day we spent at Urgent Care Centers. Both of us got bit by a tick and it was embedded into our skin. We pulled them out but wanted to make sure we got it all and that we were fine. The One-Stop Medical Center in Pulaski did a fine job for Nancy, checked the site, drew blood for lab work and gave her an anti-botic. After waiting over 3-hours at the VA Urgent Care for Les, the Dr. barely looked at the site and said keep an eye on it and come back if it gets really red. Gee thanks Doc. The road that the campground was on is part of the original Trail of Tears. As we have traveled across the south we have seen many of these signs. 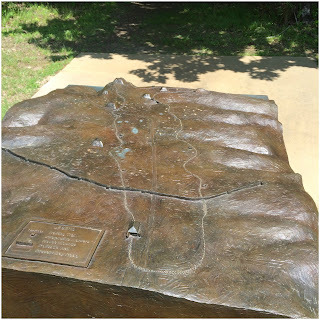 The trail remembers and commemorates the survival of the Cherokee people, who were forced to leave their homelands to live in Indian Territory, now Oklahoma. They traveled by foot, horse, wagon and steamboat in 1838-1839. They faced extremely harsh conditions and many died along the trail. At our next stop in Eddyville, KY we will explore it a little more. After a year on the road and looking at the same boring colors, Nancy's creative urge could not be resisted any longer. She really wants to paint all the walls but settled for some pop of color on the windows. Covering the window frame was fairly easy and the whole project was less than $30. It all started when we pulled the TV out of the bedroom. It never even got plug in the whole year, and was using some valuable storage space. 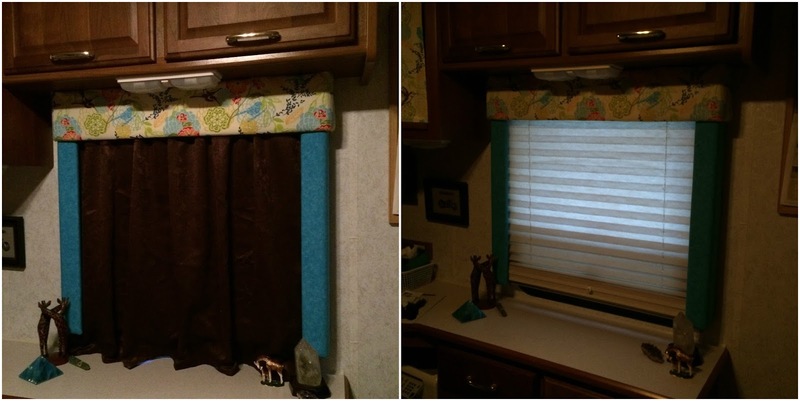 We bought a yard of colorful fabric to make a curtain to hide the storage bins we put in that space. As always one thing leads to another! 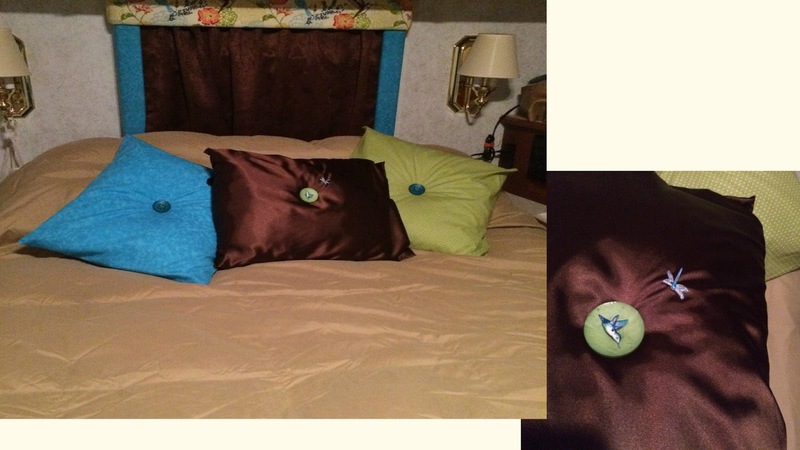 A yard of fabric was the perfect width for our window, another yard of coordinating fabric and some buttons updated the pillows. A number of how-to directions tell you to remove the window frame, which honestly just sounded like a lot of work! 1. Measure and cut the fabric to the width and length needed. For the top of the frame we added an extra 6-inches to the length so we could tuck it up inside without having to sew it down and 2-inches to the width for tucking. For the sides we added an extra 3-inches to the width to tuck along the edges and to wrap around the front and 2-inches to the length for wrapping. 1. Raw edges were sewn down, this step could be done with iron on tape. 2. The sewn edges were tucked behind the frame with a flat knife and then pulled through from the inside. 3. 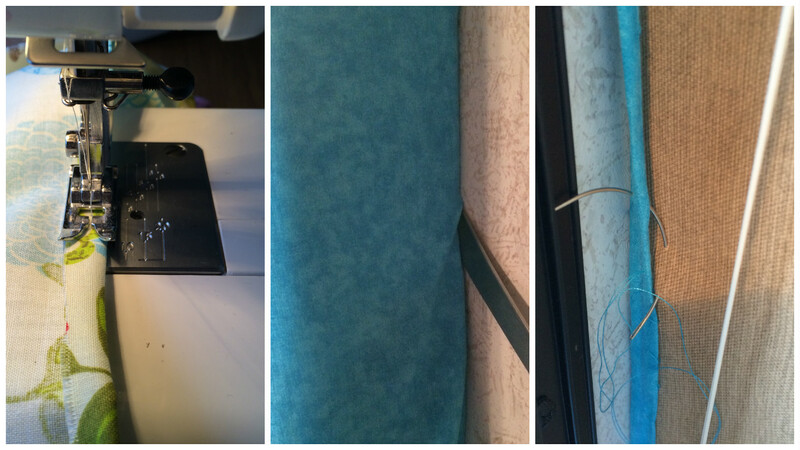 Using an upholstery needle we tacked the fabric down on the inside so it wouldn't shift. A few hours of work and we were pleased with the results.